Hoi An is a central of Viet Nam, it is bordered by China to the north, Laos to the west, Cambodia to the south, the east and south to the East Sea and more than 4,000 islands and reefs. Internal waters, territorial sea, exclusive economic zone. Convenient exchanges with countries, grasping in the center of South-East Asia. From the 16th to 19th century, Hoi An become a trading port with “Silk Road”, “Ceramic road” were formed before on the waterway, merchant ships from China, Japan, India, Thailand, Portugal, Vietnam, UK, France … flocked to trade (đổ xô đi buôn). 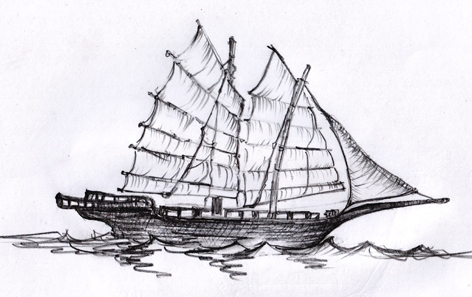 They use the sailing boat to move without engine, just the wind, because the wind is the trading wind. Foreigner come to Hoi An in wet season, driven by wind from East to West, that why the Silk Road took them long time to move to cross the ocean. Up to the river, they stop their sailing boat step on the bank, come inside the old town, some body display the wears of exchanging, some body get water, then come back to the ocean, continue to move to the ocean on the sailing boat to their next rest stop the old town of Melaka, Malaysia, between Pacific Ocean and Indian Ocean or stay here wait for next season, dry season, the wind for the west from Lao, the wind from Lao carry them by sailing boat back home from West be back home from East. The foreigners stay here a half year from west season to dry season , thus they did anything they want, that why we are the old town Hoi An talk about the culture, talk about the architect fusion between Asia and Europe, East and West, Traditional and Modern fusion. Hoi An is a material many affectation of fusion culture, fusion of architect in one. Hoi An international trading harbor, because of the wind they had to stay here, if no they didn’t want to. The same time of Hoi an, the old town of Malacca was the colonist of the Portuguese, that why the Portuguese come here, Spanish from Philippine, The Dutch from Indonesia, Japanese etc. The Chinese traded the silk grown, elephant touch from the west Lao, gold from Thai Lan, pepper from India, anything the foreigner wanted to find out, let come to Hoi an. So we are the old city, just trading, trading develop Hoi An, and right now become old, 400 years ago, it is the international trading here, it is so plentiful. Why the sailing boat didn’t bring them back in the same time, because of the wind, they still wait to stay here without moving. Long time ago, Hoi an become a meeting place of the East and West. Moreover, Vietnamese write chữ nôm script like Chinese character, A, B,C, D,E,F,G from where, from Hoi An, thanks to the missionary men , he come from Portugal, Francisco, they come from Spanish, they come from France – Alexandrop, so Hoi an play an important role in creative and in bringing more than language alphabet to the Vietnamese people become a national language nowadays, from where, from Hoi an. So we are the old city, no village, no agriculture, just trading, look like bridge, cross road. For example, this one was built by the Japanese, because of its special position like the main street of the old town, and we are now on the main street of the old town, because its special link 2 sides of the stream crossing, that why it was built by Japanese 400 years ago, but to protect the main street of the old town after the Japanese left Hoi An come back home, a lots of local people come here to visit the old town, French soldiers, American soldiers visit the main street during the war. But right now, because it so famous, because it is the symbol of Hoi an, a significant of the name Hoi- fusion, communication, combination, friendship. The Japanese left Hoi An and come back here, but the Chinese stay here forever without coming back home because the civil war of Minh dynasty and Qin (Xing) dynasty (Thanh), when 1644, they stay here forever and get married with the local people, they are called Chinese ethnic group, but after that they born here, and heritage from 15 generation, mix a half of Vietnamese, half of Chinese, even though when they come back to China, they didn’t find out their descendant (hậu duệ). The other bridge is the extra bridge to share the visitor when come to Hoi an to protect the main street, it is the Japanese bridge, this street is really old, so the government had to make another extra bridge to protect this bridge, if not it will be destroyed soon. Moving to inside Japanese bridge altar, no Quan Cong, no confusions ( Nho giáo), Taoism ( đạo giáo), this one belong to Taoism, the god of the north, you wonder the reason why have the god of the north but don’t have the god of the South, because the north is the direction of the water, you know 5 elements, the north water, the south is belong to fire, wood is the east, metal west. So the god is the north of water, related to the destiny, to the face of the business man, touching the water for smooth the sailing boat, asking for live in peace with the nature, like Machu in Taiwan ( Thiên hậu), Water in China mean money. After visit the Japanese bridge was built by Japanese, we are sitting in Vietnamese ancient house architecture, recognized by the heritage government; this is the live building, because the local people still live, they take over this property from their ancestor. This is the private house, it was built in 1780, 200 years ago, it has been pass 8 generation already, this house combine 3 styles- Japanese, Chinese and Vietnamese, the balcony is the Chinese style, the roof has 4 side facing direction is the Japanese style, and the rest of the house is Vietnamese style, this house consist 18 pillars, under the pillar has the marble base, in order to avoid the humidity, because this area every year has flood, just last year, the flood come to 1 meter, the highest is in the year 1964, 2,5 meter, nearly the second floor. They made the embroidery cloth directly. Move to upstairs, it has the drown door ( cửa tránh lụt), when have flood, they use this door to pull everything come quickly. It has the 3 old man (happiness, longevity, lucky man). 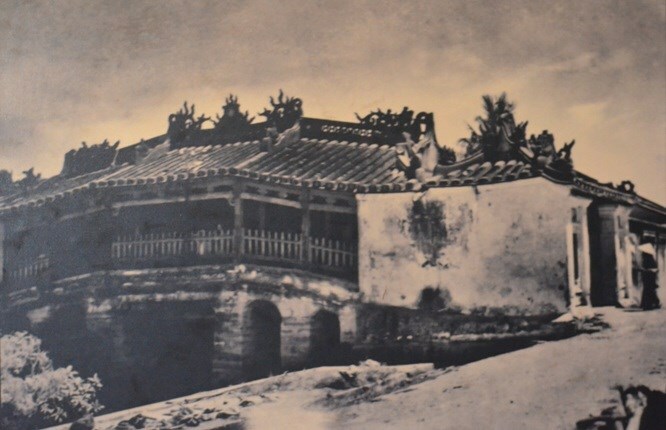 Moving to Nguyen Ancient Family Chapel ( nhà thờ cổ tộc Nguyễn). 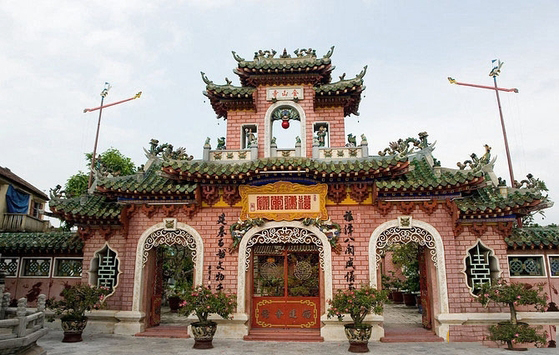 This is an ancient architectural works, was built in 1806, more than 200 years ago, the family chapel was built by the Headmaster of the Royal Army Nguyen Tương Van ( Quan Binh Bộ Thượng Thư – nhuận trạch Hầu Nguyền Tường Vân). It is Nguyen dynasty, the last dynasty in Vietnam, worship the ancestor is the responsibility of the children. The main altar, worship the first generation, he is the minister of defend under Nguyen dynasty ( bộ trưởng bảo vệ dưới triều Nguyễn). Left altar for male, and right altar for female, that is the law of nature, after light and dark, day and night, the east and the west, Asia Yan and Ying, Adam and Eva in Europe, male and female, that is the law of nature. Burning incent is how to link, is how to contact, is how to touch the other world, and the other world is the world of belief. For praying, for asking living in peace, living in harmony with nature, nature including haven above, and lower under, we are human in the middle, we are so tiny. Like in Buddhism, the world of life, the human cause any reason, they will receive the same result, it is the wheel of life, like you reap what you saw. We will see the altar of Machu ( Ma Chầu -Thiên hậu), It is the Chinese building, Chinese Assembly Hall, We talk about the Silk Road of Chinese from Asia to Europe. It has the sailing boat. 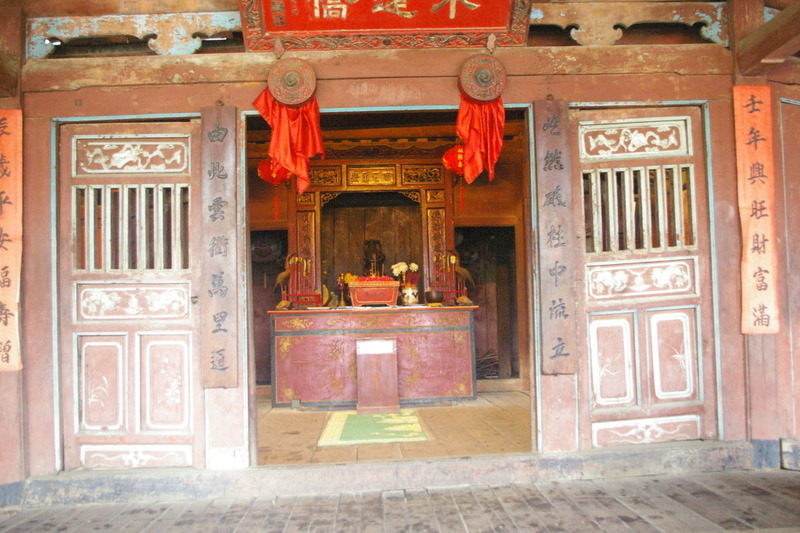 Inside the Assembly Hall they worship the Buddhism of Quang Yin like pagoda, they worship the male god of Quang Cung (confusions – Nho giáo), and female god of machau ( Taorism – đạo giáo), and they worship the ancestor in the next area, ancestor worshiping Hau. So 4 in 1 we called congregation (giáo đoàn), Fuchien, Chảu Châu, Hi Nán Iren. 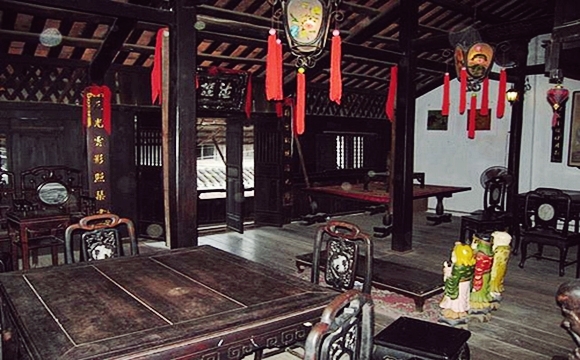 There are a lot of Chinese meeting hall in Hoi An. It is the round incense from visitor, it is @ 300,000 Vietnamese dong, it takes 3 weeks burning. For the god of Machau, the god of far hearing, the god of far seeing, present the nature, become of protector, like human saver. Move to the Sa Huynh Museum, We will see Hoi an from the map. We are sitting in Minh An Ward in Hoi An Town. So actually Hoi An is bigger than you see, the total area is 61 km2, We are in the old town of Hoi An in green one which was recognized by the world heritage site. There are a lots of visit sites along the countryside enjoy the feeling of the village with the waterwheel, with the temple, the rice field, with buffalo, and farmers, and a lot of tradition cultivation ( canh tác), carving, fishing. It has the beautiful beach, has river bank in blue one. These things is 2 thousand year before Chris (BC), evident of habitation of Hoi An in long long time ago, descendent ( hậu duệ) of Cham Pa People later, from the 2nd century to 15th century, this place belong to Cham Pa Civilization, and the end of 15th century, the north move to southern expansion, the foreigners come and they did anything they want, they use the opening policy, they opening the recon tact with (khéo léo) the outside world, encourage to do the business with the foreigners, and close to the ocean, so that why the foreigners chose Hoi An for transit. Wishes you enjoy our article!